Enjoy this special collectors' edition of books 4 to 6 in the Justin Hall series including a bonus novella: Double Agents, The Diplomat, Rogue Agents and Shadow Agents, from Ethan Jones, the master of international intrigue and bestselling writer. The CIA learns that a powerful Chechen terrorist group is plotting a major attack on US soil just as the same group assassinates Russia’s Minister of Defense in Moscow. The CIA and the FSB, Russia’s internal security service, deeply distrust each other, crippling any CIA efforts to unravel this plot. Justin Hall and his partner, Carrie O’Conner—two of the Canadian Intelligence Service best operatives—are dispatched to Moscow to secure the FSB’s intelligence, which will allow them to discover the plotters. But an FSB spy and a CIA double agent are dead set against this mission. Justin and Carrie find themselves on the run on treacherous Moscow grounds and are forced to form a shifty alliance with rogue operatives. 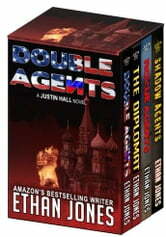 As loyalties change in the blink of an eye, Justin and Carrie hunt down Chechen militants in their stronghold in Dagestan, to uncover the truth, and to stop the terrorist attack in the US. Justin Hall is in Lagos, Nigeria, to handle the exchange a Canadian diplomat who has been taken hostage for ransom by local rebels. The dangerous exchange goes sideways, and Justin wonders if he can trust his team. Scroll up, click to buy now, and join Justin Hall as he embarks on these explosive missions—and be part of the series that is igniting the globe!